TRENTON, N.J. -- New Jersey Gov. Chris Christie and the Democrat-led Legislature are returning to work to try to resolve the state's first government shutdown since 2006 and the first under Christie. The Republican governor and the Democrat-led Legislature failed to reach an agreement on a new budget by the deadline at midnight Friday, CBS New York reports. In a news conference Saturday morning, Christie blamed Democratic State Assembly Speaker Vincent Prieto for causing the shutdown. "If there's not a resolution to this today, everyone will be back tomorrow," Christie said, calling the shutdown "embarrassing and pointless." He also repeatedly referred to the government closure as "the speaker's shutdown." Christie later announced that he would address the full legislature later at the statehouse on Saturday. Prieto remained steadfast in his opposition, reiterating that he won't consider the plan as part of the budget process but would consider it once a budget is signed. Referring to the shutdown as "Gov. Christie's Hostage Crisis Day One," Prieto said he has made compromises that led to the budget now before the Legislature. "I am also ready to consider reasonable alternatives that protect ratepayers, but others must come to the table ready to be equally reasonable," Prieto said. "Gov. Christie and the legislators who won't vote 'yes' on the budget are responsible for this unacceptable shutdown. I compromised. I put up a budget bill for a vote. Others now must now do their part and fulfill their responsibilities." Christie ordered nonessential services to close beginning Saturday. New Jerseyans were feeling the impact as the shutdown took effect, shuttering state parks and disrupting ferry service to Liberty and Ellis islands. Police were turning away vehicles and bicyclists at Island Beach state park in Ocean County. A sign posted at the park entrance featured a photo of Prieto and the phone number of his district office in Secaucus, along with the caption: "This facility is CLOSED because of this man." When asked about the sign, Christie spokesman Jeremy Rosen said the governor wanted to make sure people knew why the site was shuttered. "Speaker Prieto single-handedly closed state government," Rosen said, adding that the governor wanted to make sure families "knew that the facilities were closed and who is responsible." Prieto's office didn't respond to a request for comment. Christie and lawmakers are in a stalemate over whether to include legislation affecting the state's largest health insurer into the state budget. Christie and Senate President Steve Sweeney agree on legislation to make over Horizon Blue Cross Blue Shield, including allowing the state insurance commissioner to determine a range for the company's surplus that if exceeded must be put to use benefiting the public and policyholders. But Prieto opposes the plan, saying that the legislation could lead to rate hikes on the insurer's 3.8 million subscribers and that the legislation is separate from the budget. Prieto has said he will leave open a vote on the $34.7 billion budget that remains deadlocked 26-25, with 24 abstentions, until those 24 abstentions change their mind. Democratic Assemblyman Vince Mazzeo, of Northfield, was among those abstaining. He reasoned that if the governor did not get the Horizon bill, then nearly $150 million in school funding -- $9.6 million of which would go to his district -- would be line-item vetoed out of the budget. And indeed, Christie said Friday during a news conference that he would slash the Democratic spending priorities if he did not get the Horizon bill as part of a package deal on the budget. "You want me to wave a magic wand to get a budget?" Christie said. "I can't get a budget to my desk. Only the Senate and Assembly can get the budget to my desk." 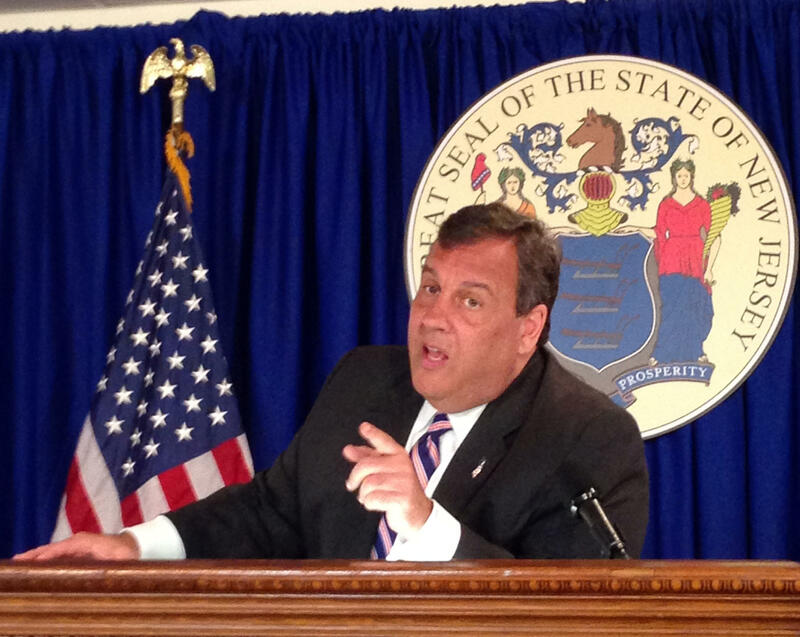 Christie said public workers should not expect any back pay. "It seems like he's just being stubborn," Mazzeo said of Prieto. "With all due respect to the speaker, then there should be some type of negotiations." But Prieto said it's lawmakers -- fellow Democrats -- like Mazzeo who are to blame for the shutdown. He said he is willing to discuss the Horizon legislation but after the budget is resolved. All 120 lawmakers face voters this year. The Senate left Friday without passing a budget, but approved on Thursday the Horizon legislation that Christie supports. Christie is term-limited and is expected to be out of office by January. Election Day is Nov. 7.